Why is Choosing the Right Tires So Important? Tire failures are a frequent cause of motor vehicle accidents and selecting a quality tire is the best way to ensure a tire failure doesn’t lead to a crash. When a tire fails it negatively impacts the driver’s ability to control the vehicle which poses a danger to passengers, other motorists, and pedestrians. Structural failures can be caused by poor design or manufacturing techniques. This leads to poor adhesion between the belt and tire tread which can cause tread separation or a blowout. These failures often occur without prior warning and problems with tire structure are not always detected upon visual inspection. However, when physical signs of structural failure are present, they include bulges, warping, and cracks within the tire surface. Tires must remain properly inflated at all times and when a tire is underinflated, it causes excessive flexing of the tire’s sidewall. 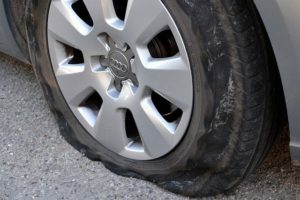 This leads to heat buildup which can cause the tire to blow out or the sidewall to separate making the vehicle unstable. Poorly designed or improperly manufactured tires can lead to gradual separations within the tire layers which can slowly release air. This process may not be apparent while the vehicle is parked, but it can accelerate suddenly as the vehicle moves down leading to a blowout when the pressure gets too low. Conversely, over inflation increases the likelihood that a tire will blow out when the vehicle travels over potholes, speed bumps, etc. Thus, tires that do not maintain air pressure or allow for the buildup of excess air pressure both pose a significant risk to motorists. Motorists in Nevada should select the most appropriate tire for their make and model of vehicle. In most cases, this information is located on the driver’s side door jamb. Choosing the most appropriate tire includes considering the types of driving the vehicle will be required to do (i.e. city, country, desert, mountains) as well as the types of weather conditions the vehicle will operate within. This is especially important for vehicles that will drive in winter conditions where snow, ice, and slush are present. For motorists who plan to drive in winter weather, they must select tires that are suited for the task and will ensure the greatest amount of tread contact with the road surface.